Over a year ago we reviewed Arturia‘s BeatStep pad MIDI controller and step sequencer. Now, the company is at it again, having released an updated version of the device, called the BeatStep Pro. Clearly the BeatStep Pro looks more fully featured than its smaller brother, but just how much better is it? And is it worth the extra $120? An important part of this kind of hardware is its interface and how easy it is to use and understand. Arturia has been creating devices with easily understandable interfaces for a long time now, and the BeatStep Pro is no exception. The BeatStep Pro features 16 touch sensitive rotary knobs, and when turned the value is displayed on the main ‘tempo/value’ display. This allows for much more precise value changes than would otherwise be possible. The device also includes 16 pressure sensitive pads, which can be used when the device is both in controller mode and when it is in sequencer mode. Last but not least is the step buttons, which enable and disable steps during playback. They are also usable in preset selection. That, of course, brings us to the next set of controls. 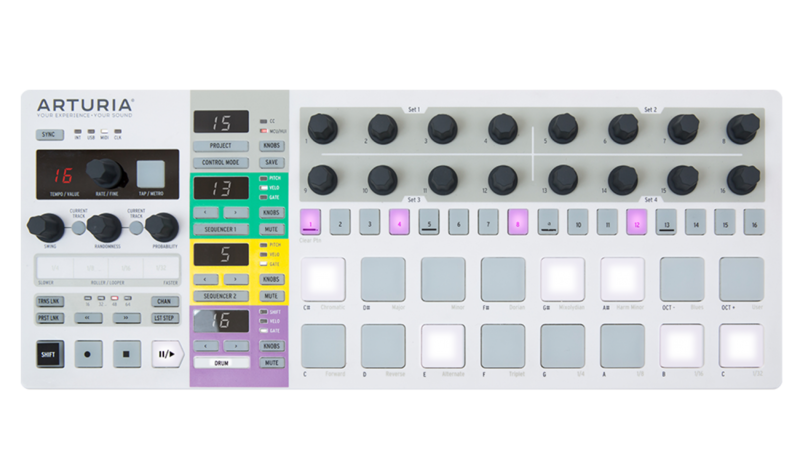 The BeatStep Pro takes things a ‘step’ further than the original BeatStep by offering two sequencers, with their own separate displays and controls, as well as a “control” mode and a “drum” mode. This allows users to control two different melodic sequencers and one drum sequencer, with easy switching between the different modes. At the back of the BeatStep Pro are CV/Gate outputs for each sequencer and 8 drum gate outputs. The BeatStep Pro essentially acts as the center of a musical setup, controlling different synths, drum machines and using MIDI on a computer, all at the same time. The true breakthrough, however, is how easy all of this is, and how small of a footprint the device takes. I was easily able to control Arturia’s MicroBrute SE. I was also easily able to connect it to control virtual instruments, however doing this may take a little more messing with the settings. Thankfully even this is easy to do with Arturia’s MIDI Control Center, which allows for tweaking of all the controls on the BeatStep. The software also allows for the saving of presets, which is great for those that might use a range of virtual instruments in their arsenal. It would be impossible to talk about every single feature that the BeatStep Pro offers, and this is not a how-to guide. It is not, however, impossible to mention how helpful of a product it is. This is especially true for those that use other Arturia products, such as myself. While the original BeatStep was a great device for those wanting to have an easy way to take control of one or two devices, the BeatStep Pro takes things to the next level, while retaining the price of a budget product. I don’t do this often, but Arturia has earned the score that it has gotten.